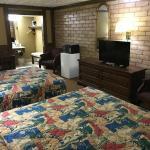 Providing free WiFi Stratford House Inn is situated in Branson within 600 metres of Mickey Gilley Theatre. The property is around 800 metres from Titanic Museum 1.9 km from Andy Williams Moon River Theater and 2.1 km from Ride the Ducks Branson. Silver Dollar City is 4.1 km from the property. All guest rooms in the motel are equipped with a coffee machine. Rooms are complete with a private bathroom fitted with a bath while some rooms at Stratford House Inn also provide guests with a seating area. Guest rooms will provide guests with a microwave. Branson Landing is 6 km from Stratford House Inn. The nearest airport is Springfield-Branson Airport 67 km from the motel.